FOR THE BJP, the 2017 assembly elections in Gujarat were a wake-up call. The party, which has been in power in the state since 1995, was reduced to 99 seats, from the 115 it was holding in the 182-member assembly. The Patidar factor is believed to have played an important role in the outcome, as Hardik Patel had openly asked his community to vote against the BJP. Since 2015, when he rose to prominence as the leader of the agitation demanding reservation for Patidars, Hardik has been a thorn in the BJP’s side. And with the 2019 general elections approaching, he launched an indefinite fast for Patidar reservation and farm loan waiver. Support has been pouring in for Hardik ever since he began his fast on August 25. Patel youth in various villages and small towns across Gujarat sat on token hunger fasts and many of them shaved their heads as a mark of solidarity. Trinamool Congress leader and former Union minister Dinesh Trivedi, Gujarat Congress president Amit Chavda and activists-turned-MLAs Jignesh Mevani and Alpesh Thakor were among the politicians who called on Hardik. Several opposition leaders also took to social media to extend their support. Former prime minister and Janata Dal (Secular) chief H.D. Deve Gowda wrote to Prime Minister Narendra Modi, requesting him to intervene to save Hardik’s life. He appealed to Modi to set up a commission to look into the issue of reservation for Patidars. In the face of growing pressure and reports of Hardik’s deteriorating health, the state government made its first official comment about the fast on September 4. Energy Minister Saurabh Patel alleged that the fast was an idea of the Congress. (The Congress rejected the allegation and said that Hardik was voicing people’s concerns.) According to him, the state government has spent crores of rupees for farmers. Later, he added that the government was worried about Hardik’s health and that it would be open to talks if Patidar organisations mediated. It may not be a coincidence that Hardik chose to start his hunger strike on the third anniversary of the zenith of the Patidar agitation. Soon after the minister’s statement, representatives of six Patidar organisations had a meeting. One of the representatives, C.K. Patel, claimed that Hardik was ready to end the fast if the Patidar organisations requested him to do so. They met government representatives, including ministers Bhupendrasinh Chudasama, Pradipsinh Jadeja and Kaushik Patel, at Gandhinagar. The government requested the organisations to ask Hardik to end the fast. It also said it would consider the issues discussed during the meeting, though no information was released about the topics discussed. However, it is learnt that these organisations have a history of pro-government stances. Ahead of the 2017 assembly elections, its representatives had criticised Hardik for sticking to the demand for reservation. Manoj Panara, a representative of Hardik’s Patidar Anamat Andolan Samiti (PAAS), said that none of its members had met any representative of the six organisations that spoke to government representatives. 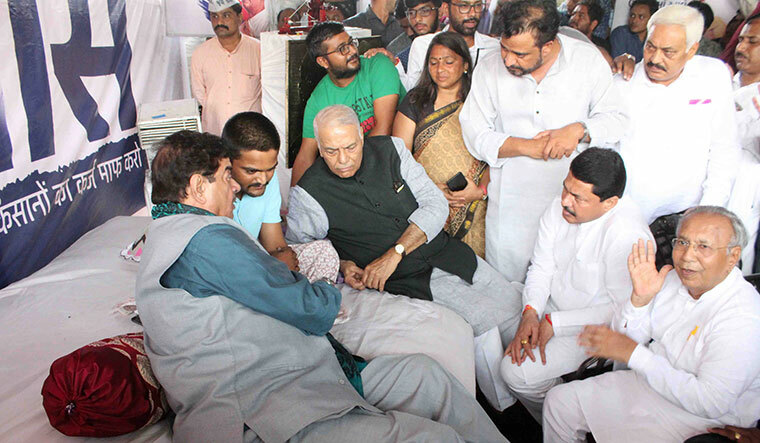 Meanwhile, BJP leaders such as Shatrughan Sinha, former Union minister Yashwant Sinha and former Gujarat chief minister Suresh Mehta visited Hardik. Sinha said that Hardik’s fast was instigated not by the Congress alone, but by “all parties”. Dr Manisha Patel, who examined Hardik, said the Patidar leader was continuously losing weight and had been advised hospitalisation. Hardik’s personal physician Dr Abhay Raj said that on the seventh day of the fast (August 31), Hardik’s weight was 70.9kg and on September 4, it was 65.1kg. He added that Hardik’s condition was critical. It may not be a coincidence that Hardik chose to start his hunger strike on the third anniversary of the zenith of the Patidar agitation. On August 25, three years ago, violence had broken out post Hardik’s mega rally in Ahmedabad, resulting in the death of 14 Patidars. The “inept” handling of the agitation saw the ouster of Gujarat’s first woman chief minister, Anandiben Patel. This time, the state government had denied him permission to hold the fast at various venues. Nikhil Savani, a member of PAAS, alleged that the state government was trying to deny them the right to protest in a democratic manner. 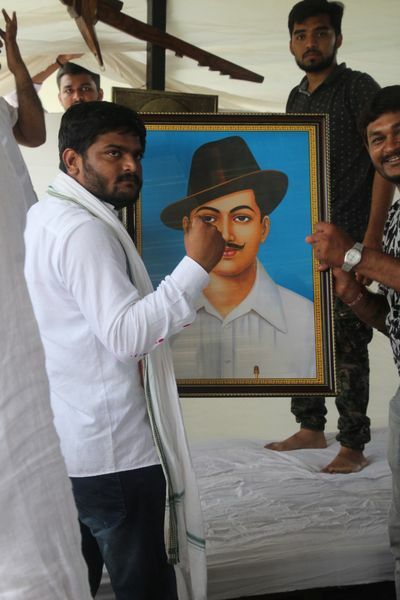 Hardik decided to stage the protest at his farmhouse near the Sarkhej-Gandhinagar Highway in Ahmedabad. He had walked out with a portrait of Bhagat Singh to start his fast, perhaps hoping to imbibe some of the fighting spirit of the late revolutionary. The state government’s initial apathy had helped bring the Sardar Patel Group (SPG), a social group, and PAAS closer. SPG leader Lalji Patel was among those who visited Hardik. Their relationship had been strained ever since Hardik, a former SPG volunteer, had stepped out of Lalji’s shadow. Hardik had once even expressed difficulty to share the stage with him. Lalji told THE WEEK that the electoral prospects of the BJP could be affected if the party ignored the Patidars and did not convince Hardik to break his fast immediately. Vishnu Pandya, a political observer who has RSS leanings, felt that the BJP was not taking Hardik seriously, but it cannot ignore the Patidar community. Patidars, traditionally BJP supporters, constitute 12 per cent of the electorate in Gujarat and there are at least 45 seats where they constitute 50 per cent of voters. Political analyst Achyut Yagnik observed that more than being worried about Hardik, the BJP is concerned about the jobless Patel youth. “This government is not in a position to provide jobs to them,” he said. In the last two years, the state government has announced several schemes targeting the community. It set up a commission for those not under any reserved category and allocated Rs 500 crore. The commission aims to give soft education loans, including for higher studies abroad, to students in need. “We do not need lollipops from the state government,” said Savani, about the schemes. “We do not want what is not right as per the Constitution and is later withdrawn.” He said that changes can be made in the Constitution to give reservation to the Patidars. Savani added that the Patidars were not carrying out the agitation to damage the BJP’s prospects. “We want reservation and we will have it,” he said. Patels are also angry about the fact that not all cases against them have been withdrawn despite an assurance from the state government. Hardik, himself, has been behind bars on many occasions, including on a charge of sedition that still stands. At 25, Hardik is now eligible to contest elections. Political analyst Hari Desai said that Hardik should understand that he will not get reservation, and added that all political parties are likely to use reservation as a “hanging carrot”. The BJP, he said, will not be able to sweep all the 26 Lok Sabha seats in Gujarat, like it did in 2014. The visits by BJP leaders and ‘support’ for Hardik from the likes of Yashwant Sinha and Ramdas Athawale, Union minister and BJP ally, suggest that the party may be trying to win him over. It remains to be seen whether the tactics would work. But, for now, Hardik continues to defy the biggest player in India’s political arena.